Colorado state Senator Ray Scott came out swinging in a blog posted four days ago defending himself against the hard-hitting new “Pay Scott” video posted online by his challenger, Chris Kennedy, that lists all the Corporate PAC money Scott takes. Scott won’t just take money from out-of-state corporate interests, but also corporations that have been fined billions by the federal government for committing egregious, widespread offenses against consumers. According to the Colorado Secretary of State, Scott takes money from the Apartment Association of Metro Denver PAC, Wells Fargo PAC in Minneapolis, General Motors PAC in Washington, D.C., and the Colorado Telecommunications PAC in Denver, among others. These are not exactly corporate interests known for working to benefit local workers. In fact, the “Violation Tracker” says Wells Fargo has been forced to pay over $5.5 billion in fines so far for offenses against working families including mortgage abuses, wage and hour violations, consumer protection violations and banking violations. 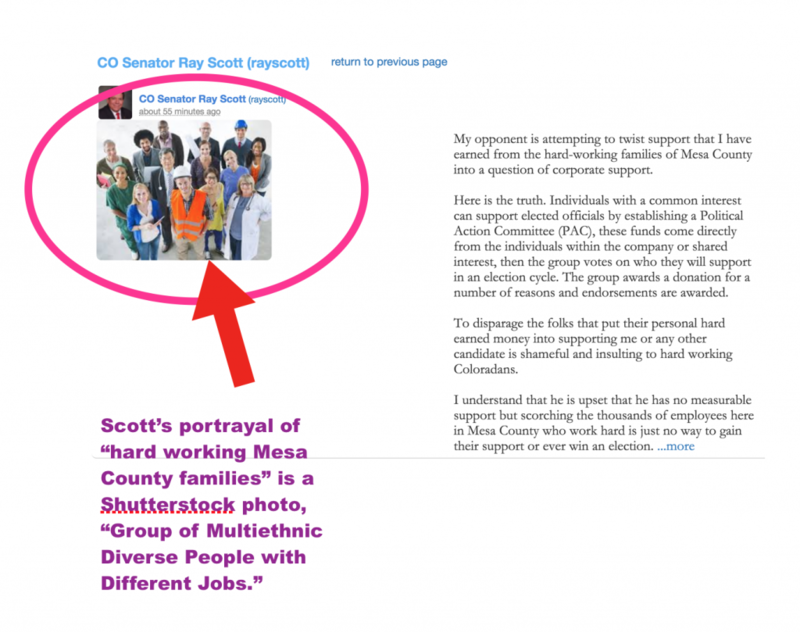 Could it be that Scott didn’t have on hand even one photo of himself visiting with real, actual hard-working families of Mesa County? It isn’t just possible. It’s probable. Scott is a corporate hack. Chris Kennedy will do so much better for the people. Then again. If truth isn’t truth, then truth must be whatever tf we want it to be right?